This is Jasser's second award. 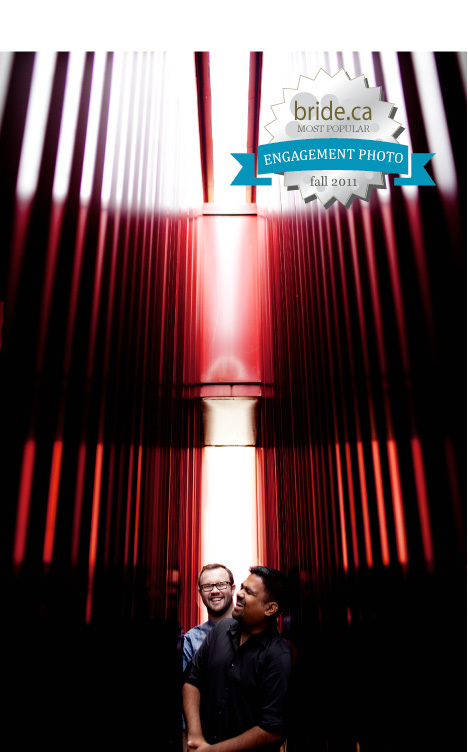 He actually won Engagement Photo of the Year, last year - wow! Third popular runner-up, an incredible couple with a story you have to read to believe, Sophia & Fayaz, photographed by Shelley Weber @ As I See It, in Calgary. About 5 years ago, Fayaz was told he has to start dialysis treatments. This occurred about a year before we met. Fayaz handled things well and he didn't let dialysis treatments get in his way of doing the things he loved including travelling, earning a degree and working. About a year ago, I decided I wanted to donate my kidney to Fayaz. I talked to Fayaz, my friends, my doctor and my family about it. They were all supportive of my choice, especially my parents. The support from friends and family was the most important strength for Fayaz and I throughout the entire process. After 6 months of assessments I found out that I am a match and all we had to do was pick a date. On June 21, 2011 I gave my kidney to Fayaz. Everything went smoothly, the surgeons were amazing and the kidney began to work right away. We were admitted together in the hospital for a week; after that we spent 3 months recovering together... and planning a wedding ;) We are now both back to work and back to our regular routines. We are now looking forward to our wedding and a nice long honeymoon all over Europe. Our second popular runner-ups (Michelle & Kevin, from St Thomas ON) win the newly minted and highly coveted Most Athletic Fiancé award - and are responsible for a lot of breakage due to failed duplication attempts in our office.. gee, thanks Kevin!